John had ten years in Launceston working with his father to learn the pottery, pipe and brickmaking trade. He met Elizabeth May Young, whose parents were Scottish immigrant farm labourers living and working at Rhodes at Longford. It was there that they were married on 26 Apr 1886. Their first child, Andrew John, was born just over a year later at Deloraine where they were living. The birth records list John’s occupation at the time as storekeeper. By the time Frank Edward was born on 12 Dec 1888 they were living in Ulverstone and John was again a potter. Mr. John McHugh, practical potter will give an exhibition of this wonderful art, displaying all the secrets and mysteries of pottery. He will during the evening form and make a number of domestic and other articles of pottery in common use. Mr. J. McHugh gave a practical exposition of the art of pottery on Tuesday evening, at the Victoria Hall. The attendance was limited, but those present were delighted with Mr. McHugh’s skilful manipulation of his work, as he manufactured by means of his lathe a variety of useful and ornamental domestic utensils, etc. The work was a novelty to most present, and was greatly admired. The clays used were obtained at Sheffield and Latrobe. The article went on to talk about the importance of establishing local industry and the role John McHugh could play. The question of encouraging and fostering in every possible way the establishment of local industries is one that should ever be before the public of a progressive community, and we think that at Latrobe, with its many natural and climatic advantages, go-ahead townspeople should always be on the lookout to pick up opportunities that offer for the introduction of anything and everything that may test and develop local resources for manufacture or export. Our attention has been drawn during the past week to the possibility of a pottery being established in this district, and a few facts that we have gleaned from Mr. McHugh, an enterprising potter who exhibited at the Victoria Hall on Tuesday night, point to the probability of such a business flourishing at Latrobe. Though, as a commencement, such an industry would not be a very extensive concern, we can see no reason why it should not develop to very considerable proportions in a few years. Mr. McHugh, who is touring the Coast at present, has inspected the various qualities of clays in the districts he passed through, finding very good samples at Sheffield and elsewhere, and near Latrobe he reports the finding of the best sample yet obtained, in a seam about 3ft 6in in thickness. This very favourable discovery should be an incentive to persons likely to be interested in the establishment of such a factory, and certainly points in the directions of success at once. The clay we refer to can be obtained in large quantities within about two miles of Latrobe, and is said to be of a quality that would produce drain pipes, tiles, flower pots, bread crocks, etc. and indeed good enough even for the finest porcelain, etc. Not only would a local factory secure local trade, but the manufacture of such articles as tiles, etc., on the spot at a reasonable price would introduce their use and create a demand that did not previously exist. The cost of a plant sufficiently large to start such works would be about 500 pounds, so that a small company might very easily deal with the question, and give the factory a fair trial. Mr. J. McHugh intends shortly to open a pottery establishment at Ulverstone. The necessary buildings for the same are now in progress. The clay required for the works will be obtained from North Motton, where a large quantity of good quality material is easily obtainable. We had an opportunity recently of visiting McHugh’s pottery erected at Ulverstone, and were surprised at the amount of work done. The building in which the work is carried out is a fairly large on, and is built of paling. Inside there is a brick furnace ready for burning and glazing the pottery, while all around the building stand shelves loaded with flower pots and other fancy articles which are drying preparatory to burning. These articles have been made form clay obtained from various localities, Castra, North Motton and Ulverstone. This establishment will be one of great utility to the coast and we hope that assistance will make it a thorough success, as the establishment of such manufacturies in our midst is much to be desired, adding as they will to the prosperity of the district in which they are in operation. 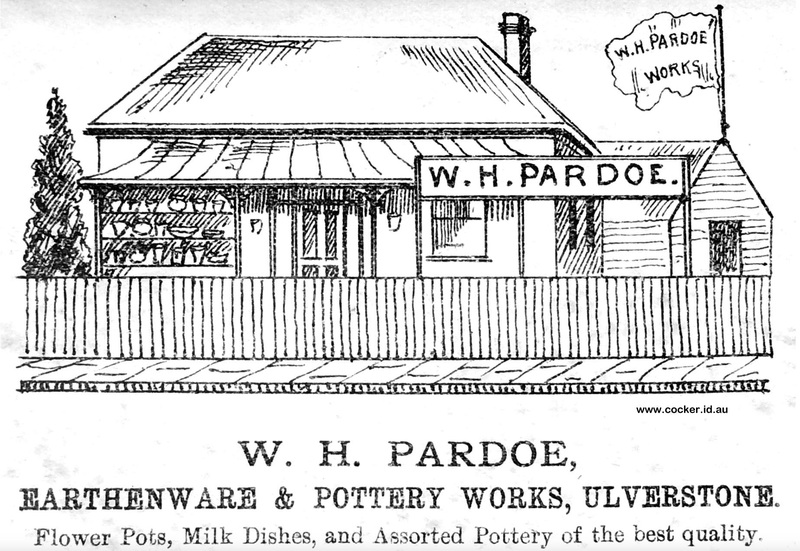 The Ulverstone pottery was established behind a cottage on Main Street – the site owned by G & A Ellis’s of General Store fame. The buildings were quite substantial and the production range extensive as was reported in detail by local newspapers of the time. The tenth annual show under the auspices of the Ulverstone Farmers’ Club was held on the Club’s show grounds today under very unfavourable circumstances, as far as the weather was concerned. The morning broke fine, but shortly after 8 a.m. rain set in, and a steady downpour took place till noon, when, however, there was a break, and fine weather prevailed during the remainder of the day. the wet militated considerably against the attendance, and although the bright afternoon attracted large numbers to the grounds, they were principally persons living in the neighbourhood. Those residing at a distance fearing to leave their homes in consequence of the wet weather. The usual side shows were on the ground, incuding Mr. Frampton’s camera obscura, and all were well patronised. The show, taken all round was an improvement on previous years, and the different exhibits attracted much attention. Mr. McHugh of the Leven Pottery Works, had a stand on the ground, which was quite a little exhibition in itself. It was nicely fitted up with jugs, jars, cups, bottles, fountains, flower pots, vases, etc. close to the stand the proprietor gave a practical exhibition in the art of making the articles mentioned. Mr. McHugh, late of Launceston, has started a pottery works at Ulverstone, which are the first in any district outside Launceston and Hobart. A bed of suitable clay, free from ironstone and all obnoxious metallic matter, has been secured , and of the products of works the North West Post says : We were shown many excellent specimens of the work produced , from large butter pans, each capable of holding 70lb of butter, down to small earthenware money boxes, very little bigger than a pepper castor. There were ingeniously contrived patent butter coolers, bread pans, garden pots ( glazed and unglazed ) milk dishes, pitchers, jugs, jars, candlesticks, and an infinite variety of other articles of domestic utility, including baskets and candlesticks of majolicaware. The manager informed us that there was a large and increasing demand for the products of the works, this, of course, only being as it should be. Judging by results, the works are well worthy of public support, some of the articles, the vases particularly, being of graceful form and tasteful design, in addition to being strong, sound pieces of earthenware. On the verandah of a neat looking cottage in Main Street, Ulverstone is to be seen, on an arrangement like a large flower-stand, a collection of earthenware, the product of the pottery works at the back of the house, which are like the organ in which this notice appears, the only thing of their kind in the “Colony outside of Hobart and Launceston. The plant consists of a horsemill, in which the clay, obtained in the vicinity, is ground, a large lathe-room, a drying room, and store. We are shown specimens of the clay, which lies in heaps round the mill, and which to our uninformed eyes, has nothing remarkable about it, but we are told by the manager, Mr. McHugh, that the clay is eminently suitable to the purpose for which it is so used, being entirely free from ironstone and from all obnoxious metallic matter, and that it is also extremely tough and cohesive in its unbaked condition, after having been formed in either the lathe or the mould. From the mill the clay is conveyed to the lathe-room , which is a very large shed, in which the furnace is also situate, said furnace being a hollow cylinder of brick, in diameter about 10ft.,strengthened or stayed by bands of wrought iron, and heated by a series of flues attached to its exterior circumference. There are three lathes in this room, one of them having been made at the Don Engineering Works by Messrs. Finlayson Bros., and to this lathe in particular all praise is given by the present proprietor for its smooth and efficient work. From the latter room the fabrics are conveyed to the drying room, where they undergo a process of atmospheric desiccation, after which the process of glazing and baking completes the work, and the goods are then stored in the building erected for the purpose. In the latter room we were shown many excellent specimens of the work produced, from large butter pans, each capable of holding 70 lb of butter, down to small earthenware money boxes, very little bigger than a pepper castor. There were ingeniously contrived patent butter coolers, bread pans, garden pots (glazed and unglazed), milk dishes, pitchers, jugs, jars, candlesticks, and an infinite variety of other articles of domestic utility, including baskets and candlesticks of majolicaware. The manager informed us that there was a large and increasing demand for the products of the works, this, of course, only being as it should be. Given suitable clay, and skilled labor, the locally produced article should certainly drive the imported out of the market, and, doubtless, it will do so, if proper steps be taken to keep the public informed of the existence and quality of this, as of other Coast productions. We are not in a position to give our readers many details of the workings of the Leven Pottery Works, the proprietors, whilst showing all willingness to give every publicity to the result of their labors, displaying a marked reticence as to process. Judging, however, by results, the works are well worthy of public support, some of the articles, the vases, particularly, being of graceful form and tasteful design, in addition to being strong, sound pieces of earthenware.